Elongated form. Blue part around the pink face, light part of eyebrows turning up in the middle. Mouth in two parts with line in the middle. With eyes already painted. 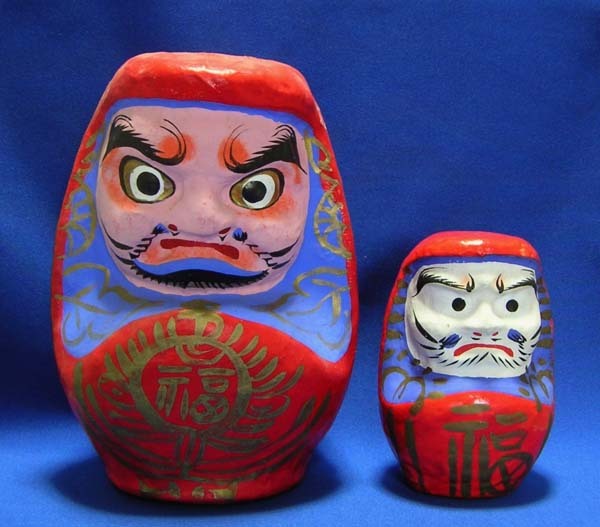 Golden pattern on red body with characters like FUKU, HOO. 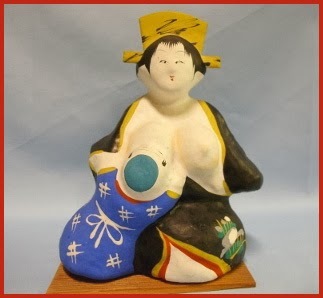 Wishfulfilling Jewel is another painting on the belly. Another oval type with blue beard on lip and chin. Simple golden lines on the red robe, showing hands clasped under the robe. 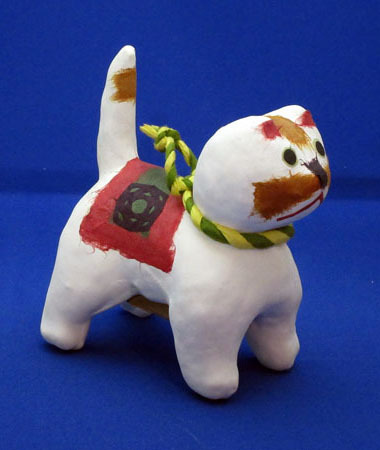 Another type has a white body and also blue and green around the face. 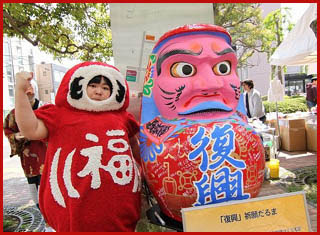 Big golden character FUKU on the belly. Usually given as a present. 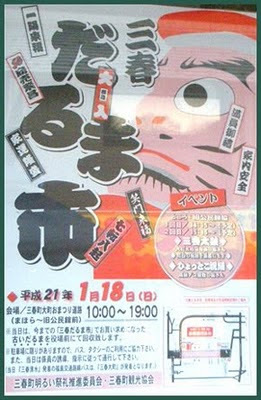 Held on the 15th of January in Miharu-machi(三春町) near Koriyama, Fukushima prefecture. This event dates back over 300 years. 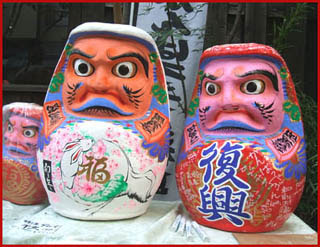 It features a Daruma, numerous roadside stands, and a drum meet (taiko taikai 太鼓大会). 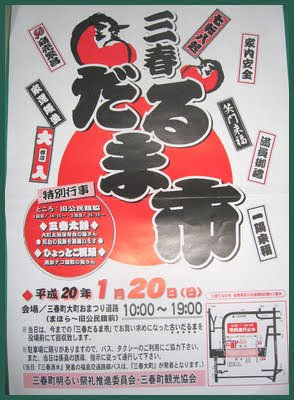 It will be held on the street in front of the Omachi Public Hall, 10 minutes by bus or a 20 minute walk from Miharu Station. More than 70 stalls seling all kinds of goods. Performance of Drummers and Dancers. 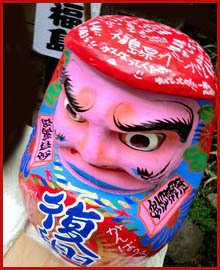 Since more than 300 years ago in the area, along with the Daruma of Shirakawa. takizakura　滝桜 "waterfall cherry tree" of Miharu. A cherry tree more than 1,000 year old is blooming in Fukushima Prefecture, northeastern Japan. The 13-meter tall cherry tree in Miharu town is designated as a national natural treasure. The town is located about 50 kilometers west of the troubled Fukushima Daiichi nuclear power plant. On Monday, the town officially declared the start of the tree blossoms. Because the branches appear like water falls, the tree is nicknamed Takizakura, or waterfall cherry. The blossoms appeared 10 days later than usual due to cold weather. 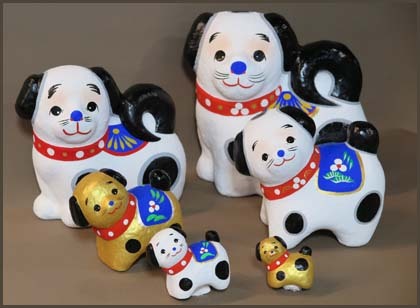 One visitor said she was deeply moved to see the tree and prayed for the prefecture's quick recovery from the nuclear disaster.
. Inu 戌 /　犬　Dog toys and dolls .